My final week of cake decorating we were told to come to class with some ideas of how we wanted to decorate our final cake. Of course I went in with nothing in mind except wanting to practice more flowers. We were given two cupcakes and an 8-inch cake and were basically told to go for it. Oh, we also learned one more new trick for flowers. Freezer flowers! I love this trick! You pipe the flowers on a piece of parchment paper and let them harden in the freezer. Then you can put them on the sides of your cake. Makes it so much easier than piping flowers on the side of a cake. 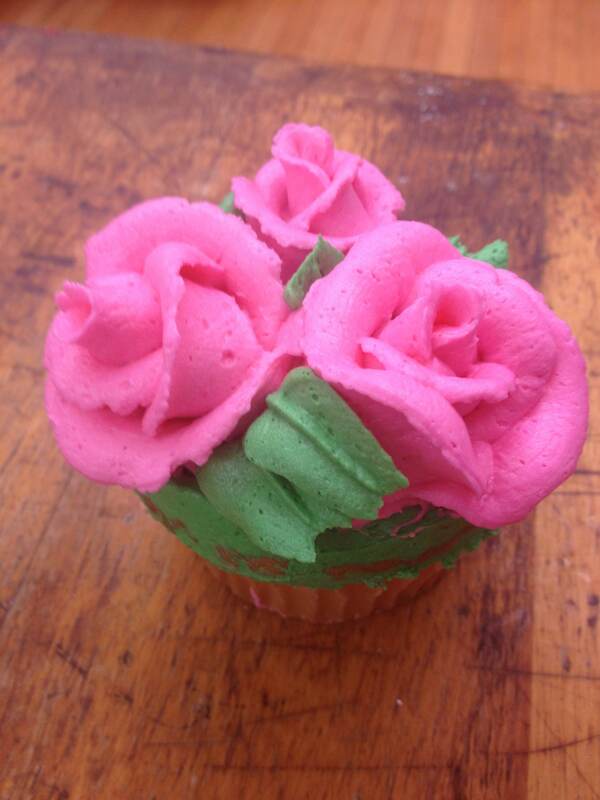 For my cupcakes I decided to practice my roses more. They definitely take a ton of practice but I think they are so worth it. I love the way that they fill up the top of the cupcake with decoration. So there you go, there are my cupcakes. They could be better but I think it wasn’t too shabby for 3 weeks of cake decorating class. Now I just need to keep practicing. Now for the cake.I wanted this cake to be my pièce de résistance, it was after all, going to serve as my final project so I had to do something that would be worthy of an A+. I decided to stay with the flower motif but wanted to really go all out with it. 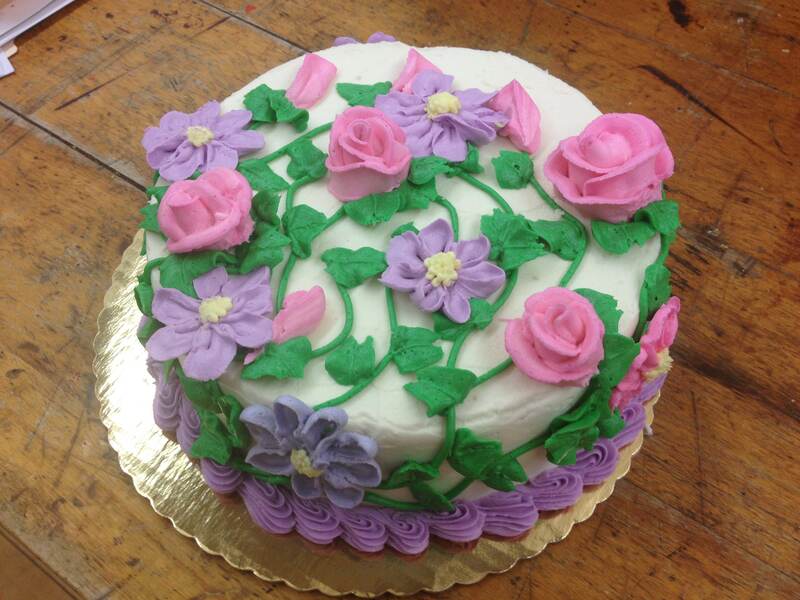 Basically covering the cake with as many flowers as I could. I figured adding in some vines would be a good way to go to really tie it all together. I’m definitely happy with the way it turned out. I loved covering the cake with the vines and the flowers. And while I’m not sure I’ll be making a ton of cakes to decorate, it was definitely good practice for my frosting roses and flowers. 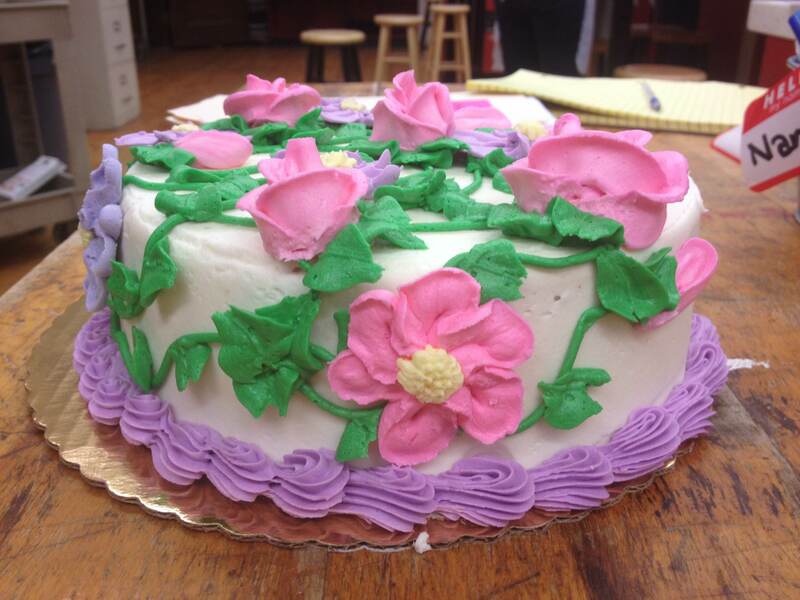 And see those flowers on the side of the cake? Those are the freezer flowers. Love them! I’m my own worst critic but I think this was my best project yet. And not too bad after three classes. I can’t wait to take more advanced classes. So what do you think about my final project?